Gnocchi is a petite small dumpling (usually made with potato or ricotta cheese) that you will usually find in Italian restaurants, tossed and served with pasta sauces or sautéed with butter and herbs. Making traditional Italian gnocchi is not difficult but it is rather time consuming. It involves peeling and boiling the potatoes, baking the cooked potatoes just until dry, pushing the potatoes through a ricer, mixing in flour and eggs, rolling out the dough, cutting the dough into dumplings, scoring the dumplings with a gnocchi paddle or a fork, and boiling in water. Sounds like a lot of work isn’t it? The French made their style of gnocchi which is delicate and tender yet lacking the graininess of potato gnocchi. When one compares the French and Italian Gnocchi, the French ones were definitely lighter and they literally melt in your mouth. The French instead of using potatoes, made a pâte à choux dough, the same dough used to make éclairs and cream puffs! The good part is – French Gnocchi (Parisienne gnocchi ) is much easier to make! You simply You simply boil milk, butter and salt. Then mix in flour. Add eggs. Stuff the wet, sticky dough into a pastry bag. Pipe little dumplings into boiling water. To make it even easier, you can use a small ice cream scoop to drop little round gnocchi into the water. When making this gnocchi, you can add any fresh herbs you like and adjust the gnocchi according to your taste. Since it’s not easy and affordable to buy cheeses such as Comté or Emmentaler cheese, I substituted those with a blend of cheddar cheese and white miso paste for the taste. The original recipe uses a tablespoon each of chopped chervil, chives, parsley and tarragon but since chives and flat leaf parsley are easily available in Malaysia, I’ll just use two tablespoons each of those. This recipe will make about 240 gnocchi. Once they've been poached, gnocchi can be frozen for a month to six weeks. Have all the ingredients ready before you begin cooking. 1) Combine the water, butter, and the 1 teaspoon salt in a medium saucepan and bring to a simmer over medium-high heat. Reduce the heat to medium, add the flour all at once, and stir rapidly with a stiff heatproof or wooden spoon until the dough pulls away from the sides of the pan and the bottom of the pan is clean, with no dough sticking to it. The dough should be glossy and smooth but still moist. 2) Enough moisture must evaporate from the dough to allow it to absorb more fat when the eggs are added: Continue to stir for about 5 minutes, adjusting the heat as necessary to prevent the dough from coloring. A thin coating will form on the bottom and sides of the pan. When enough moisture has evaporated, steam will rise from the dough and the aroma of cooked flour will be noticeable. 3) Set the heat to low and add the mustard, herbs, and the 1 tablespoon salt. Mix for a few seconds to incorporate the ingredients and release some of the heat, then add the cheese. After that, take the pot off the heat and lay it on top of a table. Add 3 eggs, one at a time, and beat quickly with the wooden paddle, until each egg is completely incorporated before adding the next one. Keep beating until when you lift some of the dough on a rubber spatula, then turn the spatula to let it run off: It should move down the spatula very slowly; if it doesn't move at all or is very dry andjust falls off in a clump, beat in the additional egg. I always check if the dough makes a V-shape like this. Keep adding eggs and beat until you reach the V shape. Once your dough forms this V-shape, then it’s ready to be piped. 5) Because this recipe makes such a large quantity of gnocchi, your arm may get tired: An easy way to pipe the gnocchi is to place a large inverted pot, or other container that is slightly higher than the pot on the right side of the pot (left side if you are left-handed) and set the filled pastry bag on it so that the tip extends over the side and the container serves as a resting place for the bag. 6) Twist the end of the pastry bag to push the dough into the tip. (From time to time, as the bag empties, you will need to twist the end again.) As you squeeze the back of the bag with your right hand, hold a knife (make sure it’s sharp) with your left hand and cut off 1-inch lengths of dough, allowing the gnocchi to drop into the pot. 7) Pipe about 24 gnocchi per batch. First, the gnocchi will sink in the pot. Keep the water temperature hot, but do not boil. Once the gnocchi float to the top, poach them for another 1 to 2 minutes, then remove them with a slotted spoon or skimmer and toss into iced water to stop them from cooking. Taste one to test the timing; it may still seem slightly undercooked in the center, but we will cook it again later. Repeat with the remaining dough. You should wipe your knife after every batch, so the gnocchi wouldn’t stick onto the knife. baking sheet in the freezer. 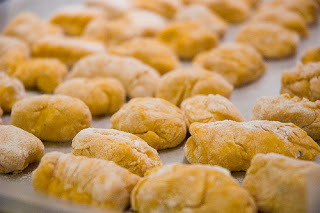 Once the gnocchi have frozen solid, remove them from the baking sheet and place in a freezer bag in the freezer. Before using frozen gnocchi, spread them in a single layer on a baking sheet and defrost in the refrigerator for several hours. Line them on baking sheet to freeze first, then store for future use. 8) To serve, boil for an extra 5 minutes and toss with great pasta sauce. You can also toss them with butter in a frying pan and then serve them as an accompaniment. My favourite way is still baking them with a cheese sauce or béchamel sauce in the oven for 25 minutes on a 180 degree Celcius oven. like macaroni and cheese. Hmm…. Gnocchi Mac N Cheese Anyone?